When engineering student Daniel Gray traveled from New Zealand to Canada to visit his girlfriend's family over winter break, the last thing he imagined he'd be doing was building a wintry retreat in -25 degree weather. But Brigid Burton, his girlfriend's mother, planned to keep him "occupied" during the long, freezing cold days by challenging him to build an igloo in the family's backyard. To prepare for the undertaking, Burton began collecting empty milk cartons in October, filling them with colored water, and leaving them in the numbing cold outdoors to form into ice bricks. Then recently, when Burton presented Gray with 500 rainbow bricks of ice, he created a wondrous, colorful igloo which took he and his girlfriend's family around 150 hours to construct! 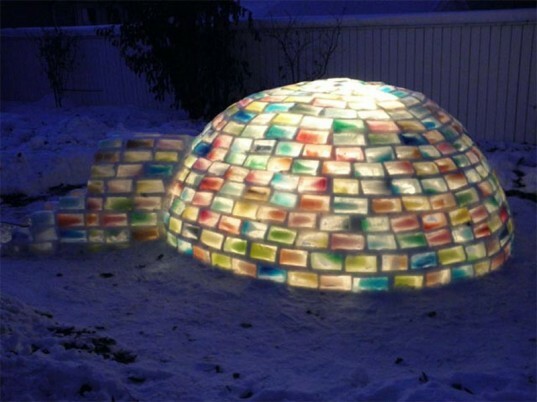 We think this whimsical abode will certainly set a new trend in igloo architecture, as who would ever want a plain white structure after seeing this colorful marvel in all its glory? Gray's vibrant igloo is literally a labor of love because he built it to prove to Burton that he is worthy of her daughter's hand in marriage. Burton admitted, "(I said) to Dan, you know if you want my daughter's hand you have to complete this, and he did it!" With regard to his building process Gray told Global Edmonton, "There was a few calculations involved, mostly regarding an estimation of how many blocks we would require, just based on it being a spherical shape." Gray devised a simple concoction he dubbed "snowcrete" to make the rainbow ice bricks stick together. Gray offers, "(Snowcrete) is just snow and water but, it sticks really well to the ice... the snowcrete just shaped and moulded however you wanted, so it made it possible." 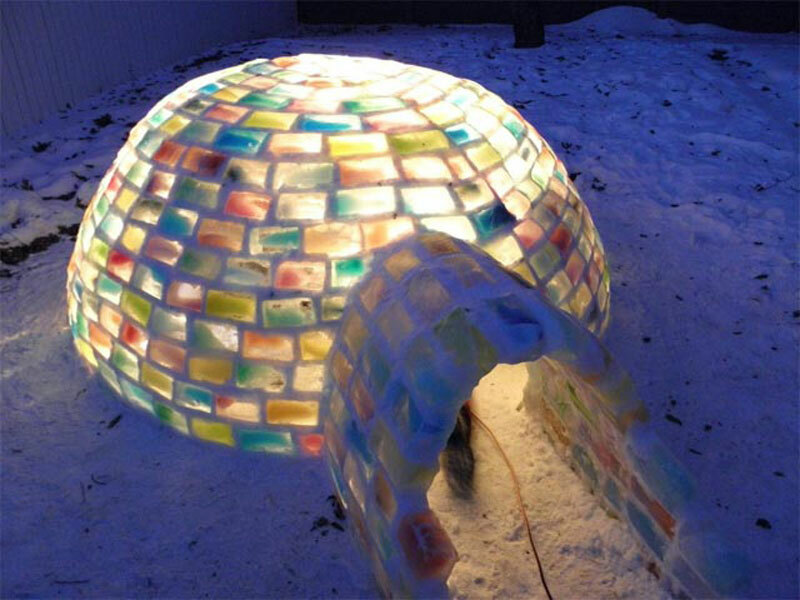 Hundreds of milk cartons were collected and filled with colored water which was frozen into icy bricks to build the rainbow igloo!